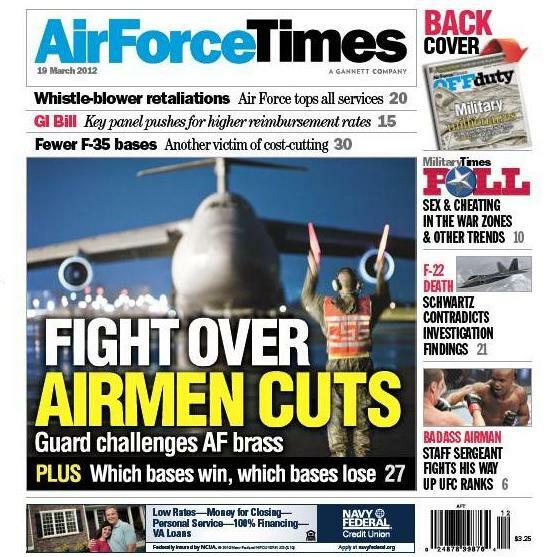 This week’s Air Force Times is so awesome, we put the word “badass” on the cover! You are at:Home»Uncategorized»This week’s Air Force Times is so awesome, we put the word “badass” on the cover! Protesting proposed cuts to the Air National Guard and Reserve, an organization of state governors has proposed an alternative proposal for how the Air Force can trim spending. Details of the plan are being close hold as the Air National Guard staff and Headquarters Air Force staff work to arrive at a dollar amount for the proposal. Air Force Chief of Staff Gen. Norton Schwartz declined to be interviewed on the matter. The fiscal 2013 budget calls for eliminating 9,900 personnel, of which 3,900 would be active-duty, 5,100 would come from the Guard and 900 from the Reserve. Air Force Times has a chart showing which states stand to lose the most personnel and aircraft.